Pictured, from left, are Bob Briant Jr., Stan Lanford, Jack Lanford, Jim Madara, Gene McCormick, Cale High, Dale High, Bob Burleson and Dr. C. Michael Walton. 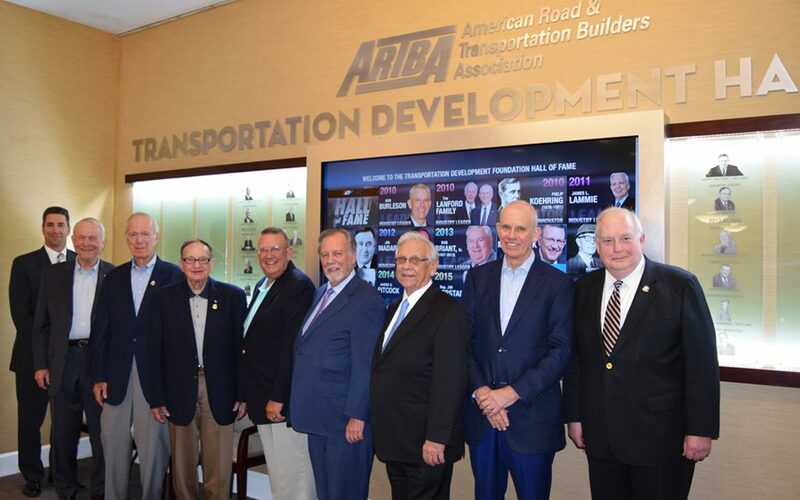 Six members of the ARTBA Transportation Development Foundation’s (ARTBA-TDF) Hall of Fame May 9 helped unveil the honorary display at the association’s Washington headquarters. Representatives of several deceased Hall inductees, plus top ARTBA officials, also attended the special reception. Brothers Stan and Jack Lanford, long-time chief executives at their respective firms, Lanford Brothers Company and Adams Construction. They are also founders of the Lanford Family Highway Worker Memorial Scholarship fund, a first-of-its kind program that provides post-high school financial assistance to the children of highway workers killed or permanently disabled on the job. Bob Burleson, president of the Florida Transportation Builders’ Association, and architect of Florida’s “Stop Highway Robbery” campaign to prevent legislative sweeps of the state’s transportation trust fund. Jim Madara, a senior vice president at Gannett Fleming, good corporate citizen, and ARTBA member for more than 50 years. Gene McCormick, retired as a senior vice president of Parsons Brinckerhoff and former principal-in-charge or project manager on highway, bridge and airport projects across America and the world. Dr. C. Michael Walton, one of the nation’s leading civil engineering professors and thought leaders, and the first member of ARTBA’s Research & Education Division to be elected chairman (2006). Cal and Dale High, sons of Sanford H. High, the innovative founder of High Welding Company in Lancaster, Pa.; and Bobby Briant, Jr., son of long-time New Jersey transportation construction legend, Bob Briant, Sr., also attended the event. The Hall of Fame display is located inside ARTBA’s main conference room. It features etched glass likenesses of the honorees on each side of a large video screen. Short video biographies of each inductee can be selected and played from a smaller touch-screen control panel at the side of the room. Nominations for the Hall of Fame’s 2016 class are due by Sept. 16. Several of the inductees shared their feelings about their induction. “It’s wonderful to be part of this with so many heralded individuals,” said Dr. Walton. Check out: www.artbahalloffame.org to learn more.